Business intelligence is information that drives organizations. Through technologies that capture, organize, stage, access and analyze data, BI gives companies the insight to make better strategic, tactical and operational decisions. The objective is to generate actionable insights, more quickly, from growing volumes of internal and external data, in order to make better business decisions. Such actionable insights could be related to supply and demand chains, competitive market advantage or internal organizational performance. 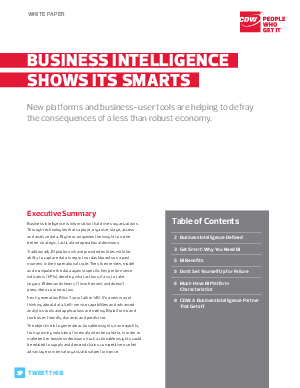 To learn more on Business Intelligence download this whitepaper.